US Leads the Industrialized World in Fire Deaths | Flue Steam Inc.
Don’t let a fire at your restaurant contribute to this statistic. According to a recent FEMA report, the US leads the industrialized world in deaths caused by fires, with 30 to 50 percent more deaths than many countries and three times as many deaths as in Switzerland or The Netherlands. Why? According to the report, the main reason could be that the US emphasizes fire suppression over fire prevention, and it turns out that prevention may be more effective in saving lives. In the US, we spend most of our money and effort on ensuring a rapid response to fires. 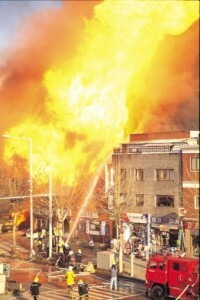 In other countries, a significant chunk of funds are also directed towards educating the public about fire prevention and enforcing regulations designed to prevent fires or limit their spread. This is why The Netherlands, which has a 30-minute response time to fires, has fewer fire deaths than the US, where a 30-minute response time would have the community up in arms. In countries where prevention is emphasized, people are apparently able to get out of harm’s way faster. Another problem that could be contributing to the high rate of fire deaths in America is the fact that we lack a single overarching fire code as is seen in many other countries. Instead, fire codes are left to individual cities and municipalities. The result is that fire prevention efforts vary widely from one part of the country to another. This is beneficial in some ways, because local agencies are better equipped to respond to the needs of the citizens and businesses in their region. However, it can also result in a lackadaisical attitude towards regulation. One area of American life where fire prevention is heavily stressed through government regulation is in commercial kitchens. All commercial kitchens are expected to have approved fire prevention and suppression systems in place. For example, commercial kitchens must have adequate exhaust systems that can effectively remove smoky, greasy air from the kitchen. They are also required to invest in regular exhaust hood and duct cleanings to prevent greasy residue from accumulating to unsafe levels and creating a fire hazard. Plus, commercial kitchens must have an automatic fire suppression system in place as a back up to quickly extinguish a fire should the aforementioned fire prevention tactics fail. If you own or operate a commercial kitchen in the LA area, Flue Steam can help you keep up with your fire code obligations and reduce the risk of a fire in your exhaust system claiming the lives of any of your employees or guests.